Download "MICROMAPPER. Users Manual. 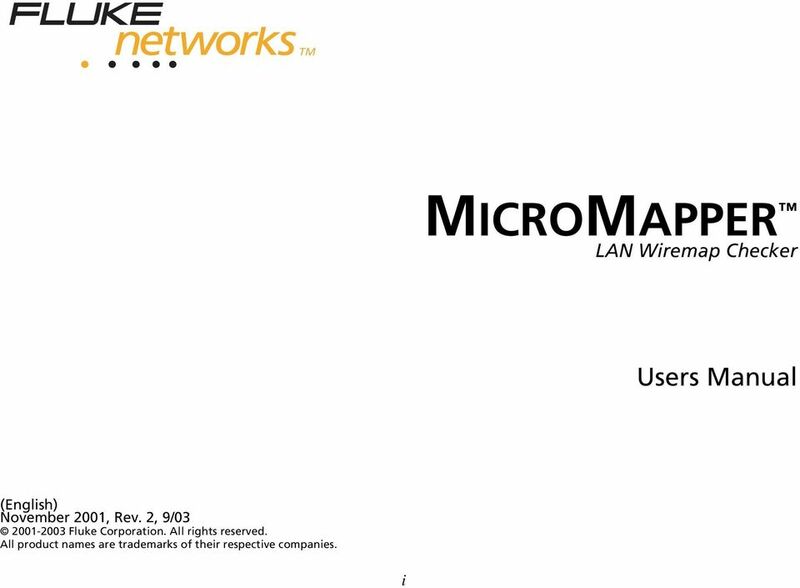 LAN Wiremap Checker"
5 MICROMAPPER Introduction Congratulations on your purchase of the MICROMAPPER network cable tester! 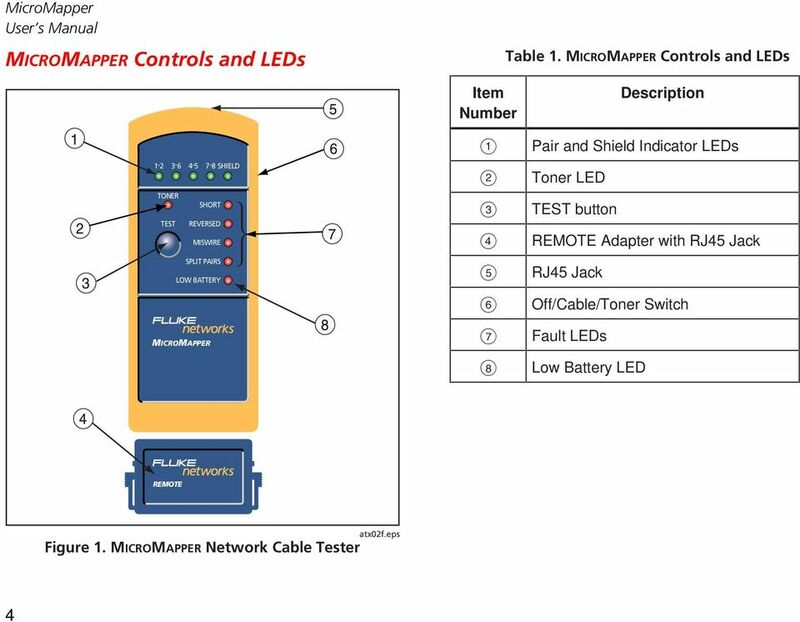 The MICROMAPPER is a hand-held cable tester that enables network professionals to quickly and easily verify the integrity of Ethernet twisted pair cables. 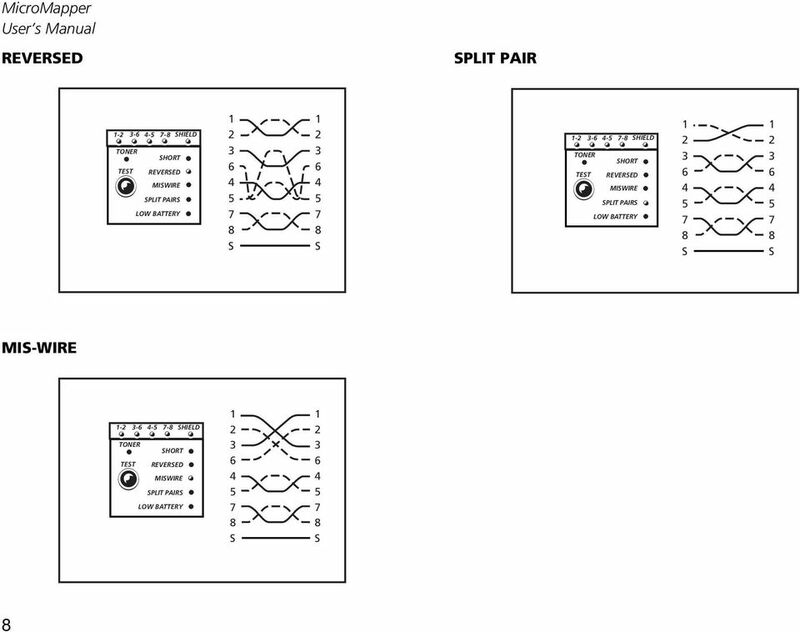 In one step, the MICROMAPPER will test twisted pair cabling for opens, shorts, reversed, crossed, and split pairs. imply slide the switch to the Cable position, press the (TET) button and the MICROMAPPER will automatically scan for any existing faults in your cable. 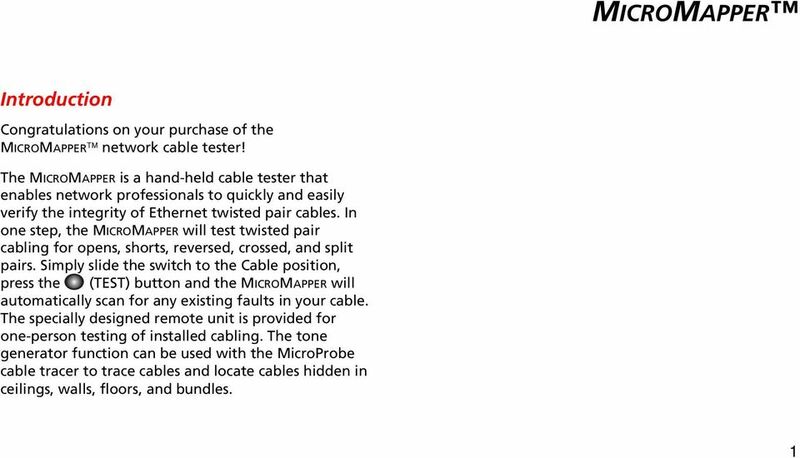 The specially designed remote unit is provided for one-person testing of installed cabling. The tone generator function can be used with the MicroProbe cable tracer to trace cables and locate cables hidden in ceilings, walls, floors, and bundles. 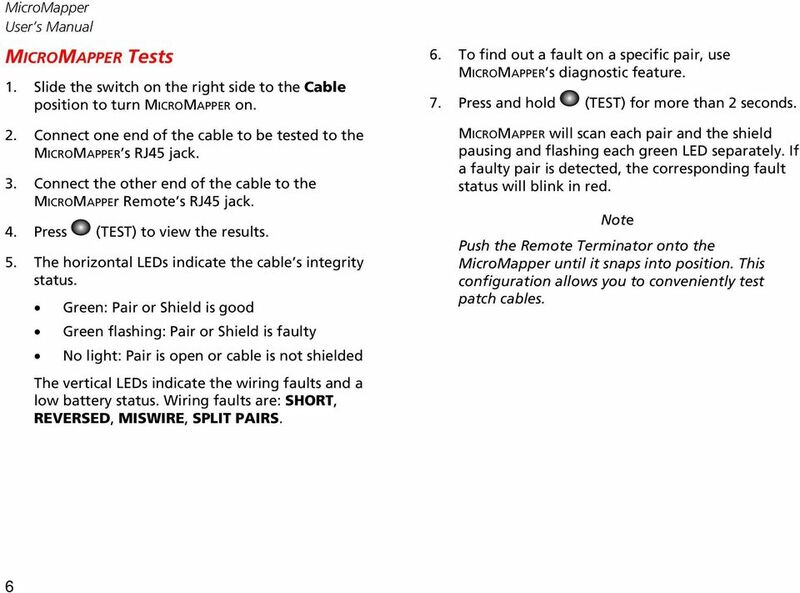 6 MicroMapper User s Manual Features Tests for wiring faults and detects opens, shorts, crossed, reversed, and split pairs. 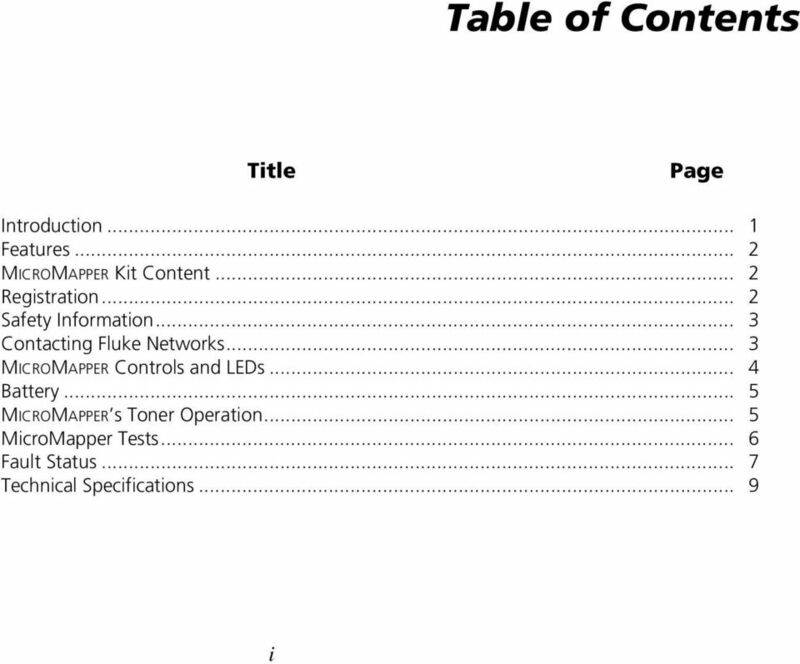 (plit pair fault detection requires a minimum cable length of." (0cm)) Verifies shield integrity MICROMAPPER s Remote Identifier enables one person to test installed cabling Easy to read fault display and high speed testing Generation of two tones for tracing cables and locating hidden cables Debug-mode for detailed fault identification results Auto-sleep mode to decrease power consumption MICROMAPPER Kit Content Your MICROMAPPER kit contains the following: MICROMAPPER network cable tester MICROMAPPER remote Patch cord Quick Reference Guide Product Manuals CD Registration Registering your product with Fluke Networks gives you access to valuable information on product updates, troubleshooting tips, and other support services. 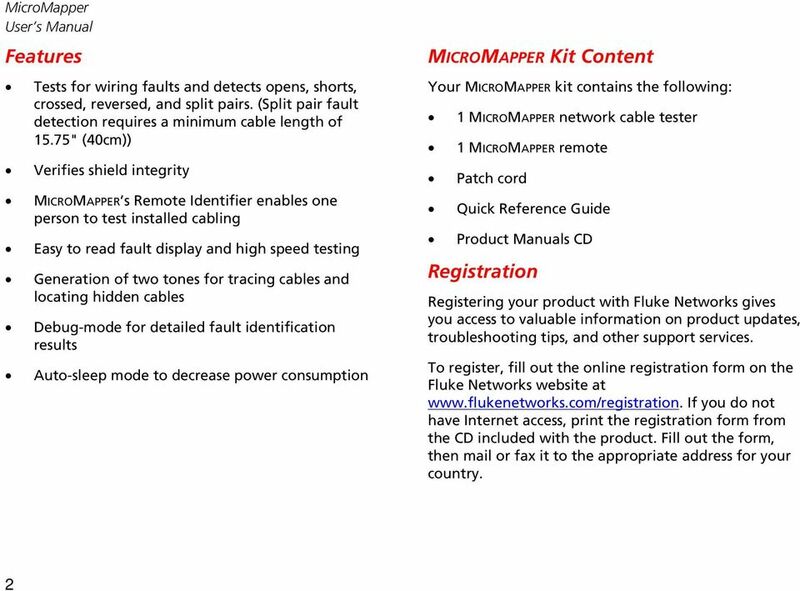 To register, fill out the online registration form on the Fluke Networks website at If you do not have Internet access, print the registration form from the CD included with the product. 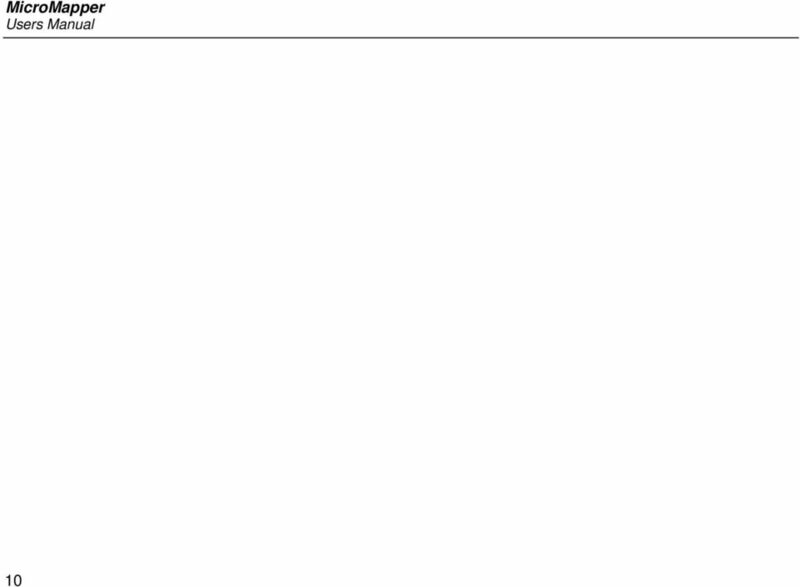 Fill out the form, then mail or fax it to the appropriate address for your country. 7 MicroMapper afety Information afety Information WWarnings Do not connect MICROMAPPER to a live circuit as it may damage the unit. Do not open the unit or attempt to repair in case of malfunction. 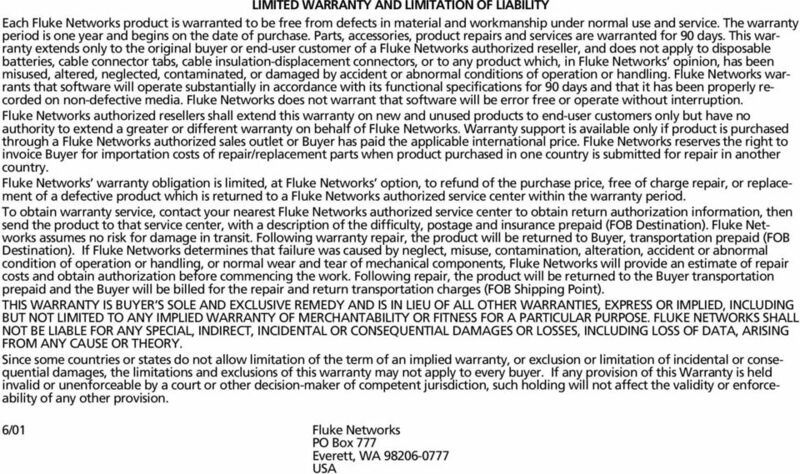 Please send it back to your distributor for repair or replacement. Caution trong radio frequency fields may cause inaccurate readings. Do not drop or get the unit wet. Do not expose MICROMAPPER to extreme humidity or direct sunlight. 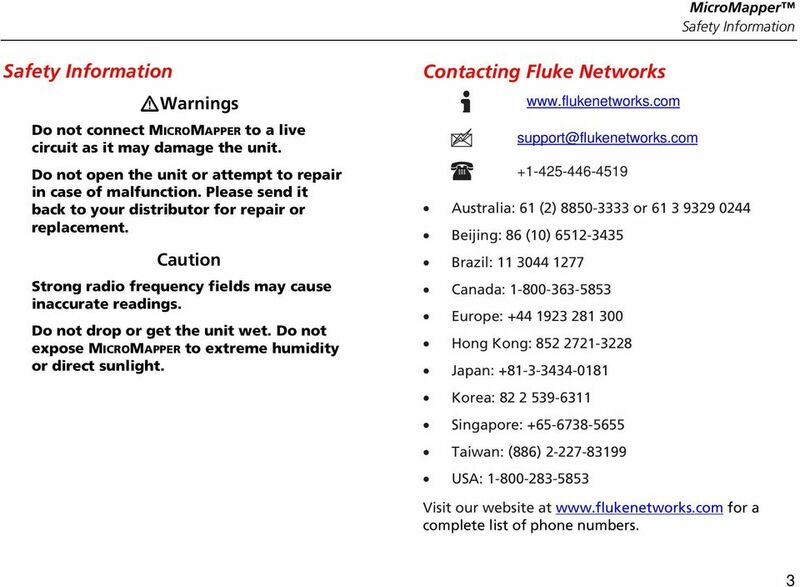 Contacting Fluke Networks Australia: () 0- or 99 0 Beijing: (0) - Brazil: 0 Canada: Europe: Hong Kong: - Japan: Korea: 9- ingapore: +-- Taiwan: () --99 UA: Visit our website at for a complete list of phone numbers. 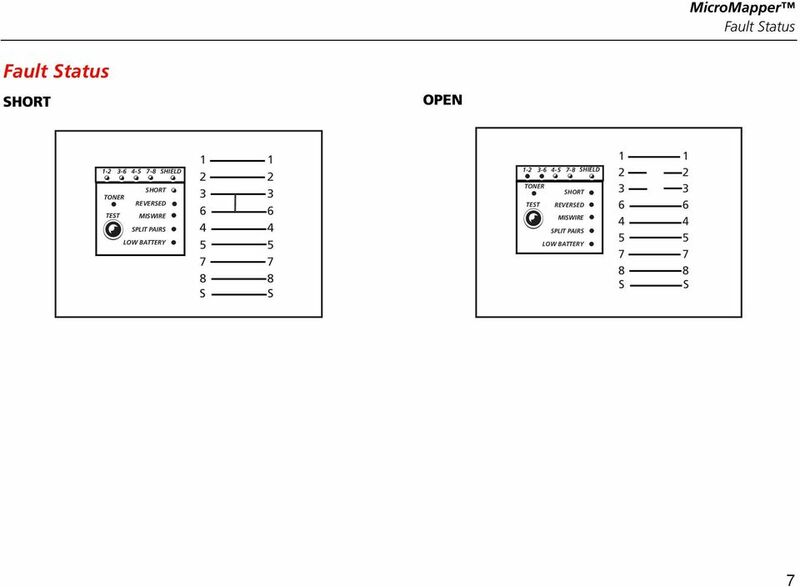 10 MicroMapper User s Manual MICROMAPPER Tests. lide the switch on the right side to the Cable position to turn MICROMAPPER on.. Connect one end of the cable to be tested to the MICROMAPPER s RJ jack.. Connect the other end of the cable to the MICROMAPPEr Remote s RJ jack.. Press (TET) to view the results.. The horizontal LEDs indicate the cable s integrity status. 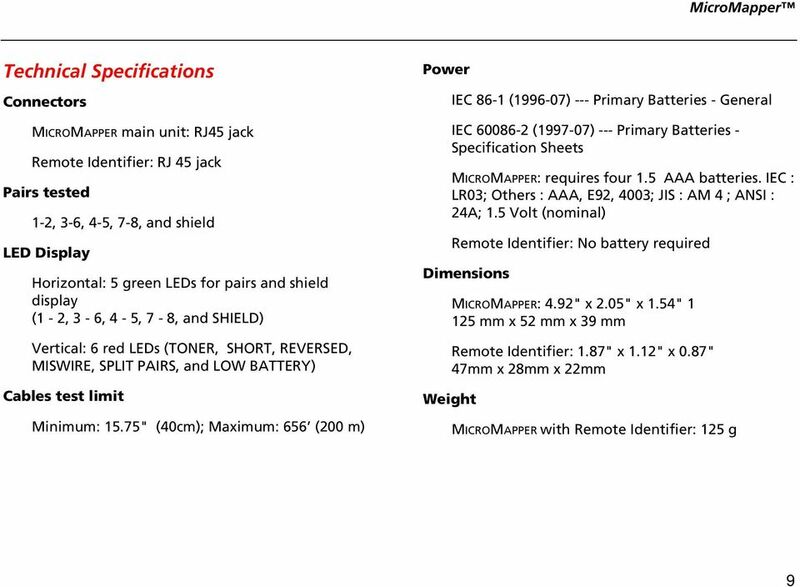 Green: Pair or hield is good Green flashing: Pair or hield is faulty No light: Pair is open or cable is not shielded The vertical LEDs indicate the wiring faults and a low battery status. 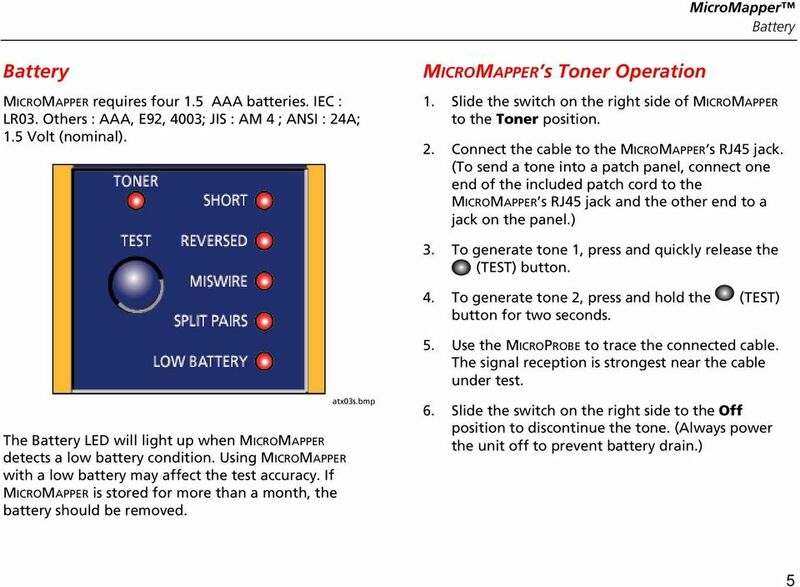 Wiring faults are: HORT, REVERED, MIWIRE, PLIT PAIR.. To find out a fault on a specific pair, use MICROMAPPER s diagnostic feature.. Press and hold (TET) for more than seconds. MICROMAPPER will scan each pair and the shield pausing and flashing each green LED separately. 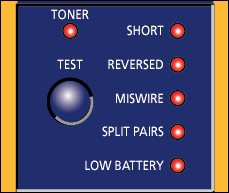 If a faulty pair is detected, the corresponding fault status will blink in red. Note Push the Remote Terminator onto the MicroMapper until it snaps into position. This configuration allows you to conveniently test patch cables. Targus Wireless Remote Presenter USER S GUIDE. Making Your Mobile Life Easier. Making Your Mobile Life Easier.